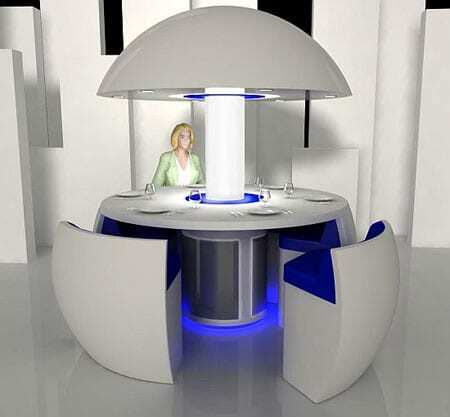 This may be the future of the modern dining table and seating according to Turkish designer Fatih Can Sarioz. It is true that quality time with the family has suffered in the past generation, and the “Kure” pod brings everyone closer together and face to face thanks to a cozy round design. When closed the spherical shape tastefully conceals six chairs and the table that also feature a nice overhead and base lighting in blue to set the perfect mood. Sarioz talents have been revealed in some outstanding industrial, interior and exhibition designs, and I have a good feeling we will be seeing a lot more brilliant furniture concepts in the future. NOTE: This is now over 10 years old and if still available is now more than likely collectible due to its unique design. Not quite vintage, more than likely retro furniture. Good luck in finding one.